Too often we photographers fall into the trap of shooting the same type of images that we have seen for years. With automobiles and car shows we will often shoot the entire car or some detail like a hood ornament, etc. I suggest you try moving beyond those cliched shots and approach the subject with an abstract approach that still speaks to the essence of the subject but isn’t so obvious. In this image I fell in love with the bright yellow paint and the complimentary red and blue accents. I chose to use them as leading lines that reinforced the diagonal pattern of the clouds above the car. 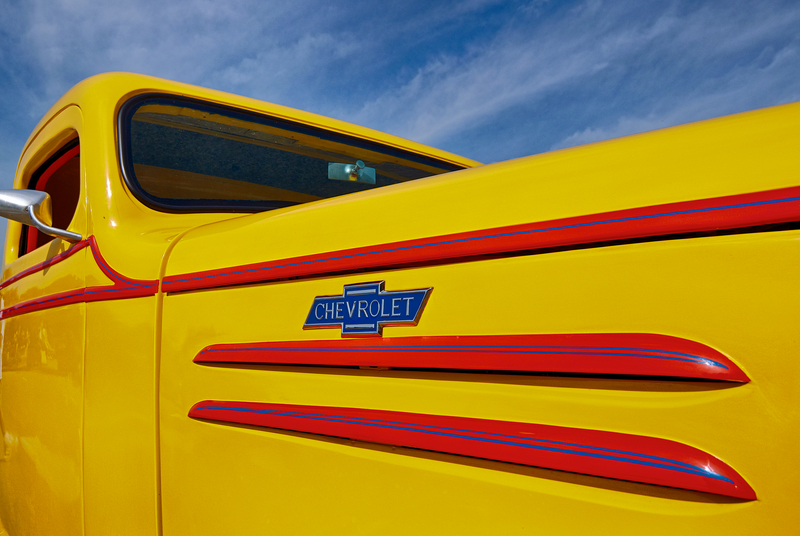 The blue sky is a direct compliment to the yellow color and also picks up on the blue pinstripes on the red louvers as it also provides background interest to the composition . While there is no question that the subject is an automobile the overall effect is to emphasize color and composition instead of being just another photo of a car. I used my regular HDR brackets +2, 0 and -2 EV and processing with NIK HDR Efex Pro 2 which allowed me to capture and emphasize things such as the texture in the clouds and the reflections in the the door. I finished the image in Aperture 3 using some minor adjustments to the blue and yellow color channels, cropping and sharpening. 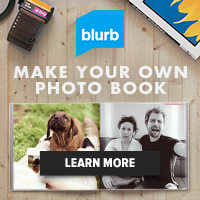 Click on the image to open it at a larger size in another window. I had a tough time shooting this year at the Streetrod Nationals due to the weather and time constraints of my own. The opening morning there wasn’t a cloud in the sky so the light was very harsh which as most photographers know makes things difficult. The second morning it was raining almost the entire time I was there which left me pretty much consigned to shooting closeups and detail shots with waterdrops on everything. I threw in the towel by noon and wrote off the event for this year. I di manage to get a few images that I liked and this is one of them. One of the toughest factors I face when photographing at this event is what I refer to as the “visual pollution” that is created with all the tents and popups that the participants erect. Due to the tents and the folding chairs that are everywhere; it is nearly impossible to isolate the cars from the clutter. Another problem arises when the owner decides to open the hood on the car to show the engine; this act usually destroys any hope of getting a decent shot of the car no matter how interesting the car is. Today’s image is from the first morning I was there and even though the whole car was incredibly well done, the place where it was parked was so cluttered with tents and the attendent items such as BBQ grills, lawn chairs, coolers and stacks of “stuff” I could not cet a clean shot of the whole car. I opted to shoot the front end and framed it as well as I could to remove those distractions. I shot a five exposure bracket set that I then edited in NIK HDR Efex Pro 2 and Aperture 3 to produce this image. This image is another pseudo HDR I created a couple of years ago using Topaz Adjust. 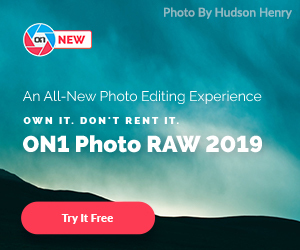 The advantage of using these plug-ins is that they can often salvage an otherwise flat image and allow me to create something rich and dynamic. The ability to extract information and enhance the colors and details within the original file is the main reason I started using them. I don’t think they are an answer for every situation, if the image is poorly composed they won’t help it, but if the exposure range is too extreme they can be invaluable and allow me to rescue my original idea for the photo. This image works because of the composition which adheres to the rule of thirds. By giving the car the bottom two thirds of the frame and placing the hood ornament at the intersection of the of the upper right third of the frame the viewer’s eye is directed there. 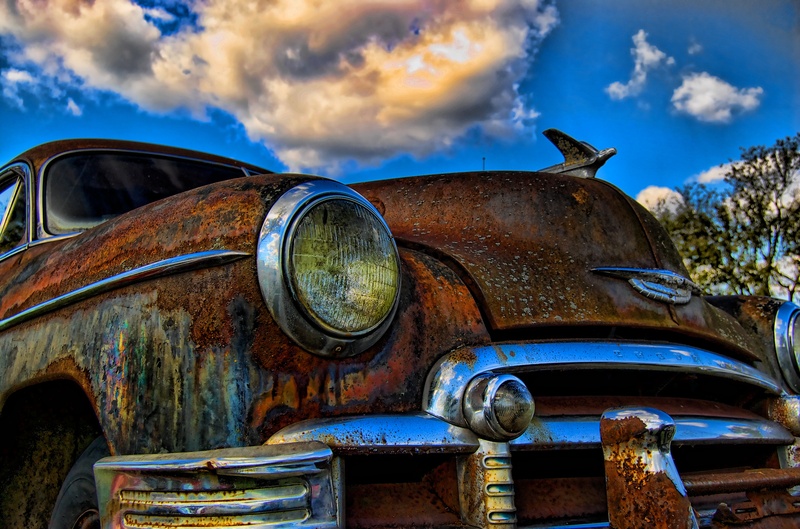 The colors of the sky reflect in the chrome and tie the blue of the sky into the dark browns and oranges of the rust on the car. The yellowish orange of the clouds further emphasizes the complimentary color scheme of the photo too. Among the lovers of the 1955 through 1957 Chevrolet the term “Tri-Five” is used to differentiate these models from the rest of their General Motors brethren. 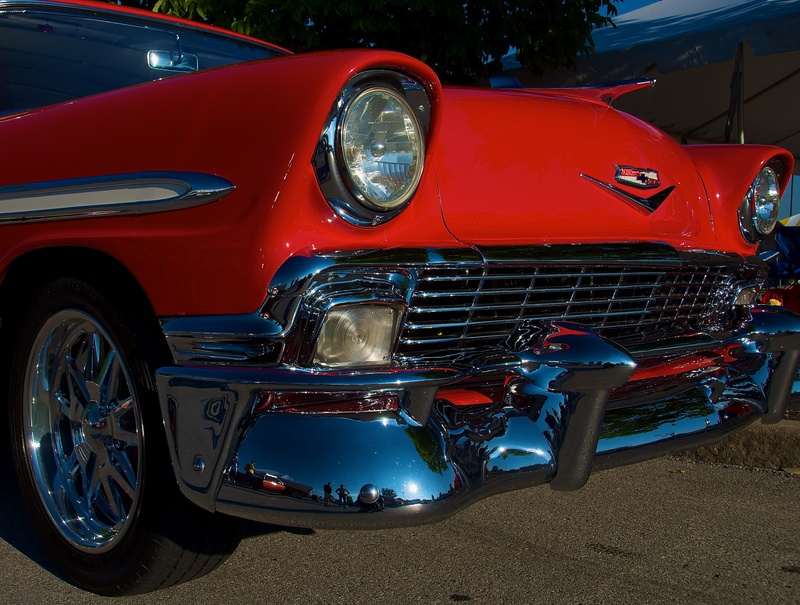 This gorgeous 1955 Chevy was parked at the Streetrod Nationals last year. I thought the overall restoration and modernization of this car was outstanding. 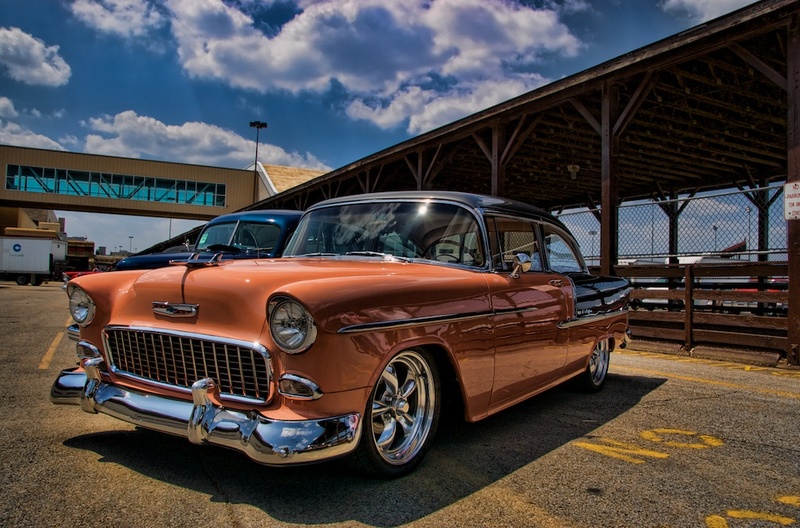 Even though it has been completely refitted with a modern driveline and custom wheels it is so well done it could fool most people into believing it is a stock 1955 Chevrolet. The interior was all reupholstered in new old stock factory seat covers and interior panels. The radio was hidden somewhere in the car but the controls looked like the original radio knobs and tuning dial. I like this composition for it’s repetition of the forms that occur in the roof behind the car and the sky bridge at the left side of the image. The strong diagonals of the buildings reinforce the the placement of the car in the frame while the colors in the scene are harmonious and intensified. I used Topaz Adjust and Aperture 3 to process the image.